Pour Taproom, an Asheville-founded bar where patrons self-order libations by the ounce and not by the glass, is nearing its opening in Atlanta. The "world's largest self-pour bar" will offer 85 craft beverages from multiple breweries, wineries, and cideries, starting late-April, 2019. 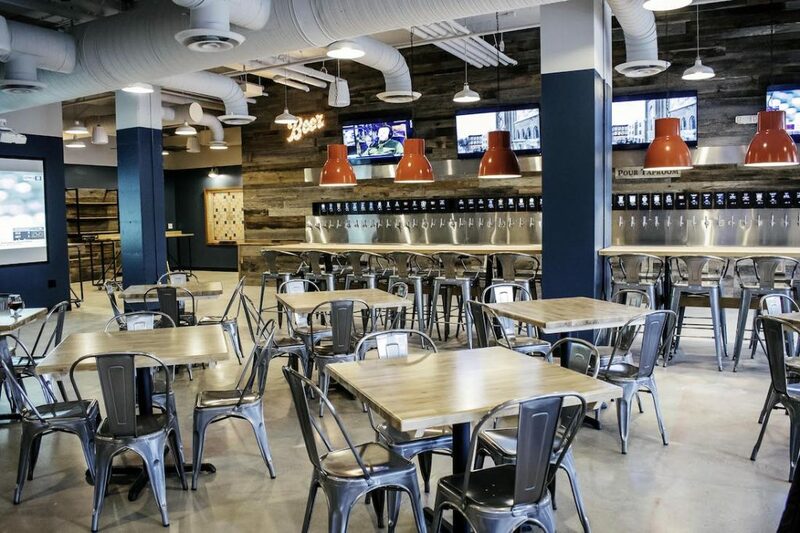 "Our model is designed to create a place where our guests can come and try everything without the commitment to an entire pint,” Ray Ballester managing member of Pour Taproom Atlanta, said in a press release Thursday. Every guest is provided with a unique QR code that has been loaded with a credit card of their choosing. At the taps, guests scan the QR code to dispense the craft beverages in one-ounce increments. "A staff member will always be available for questions however guests will also note that above each tap is a screen offering the untapped description for each beverage, keeping the process seamless, educational and fun," according to the release. At the end of each visit, patrons can leave their QR card in a bucket and the form of payment given at entry will be billed or they can settle up with a staff member with a different form of payment. Pour Taproom has two 16-foot double accordion style doors to connect the indoor space with the outdoor area and 12-foot oak and steel bar tables designed by Summit Design Company include built-in charging stations for electronic devices. The space also boasts a 130-inch projector screen and six TVs. Yard games like giant scrabble and shuffleboard are also available. On the food side of things, Pour Taproom has partnered with Nina & Rafi (located next door) to offer a menu of pizza. Pour Taproom, at 661 Auburn Avenue NE Suite 230 in the SPX Alley development, will be open Sunday through Thursday Noon until Midnight, and Friday and Saturday Noon until 2:00 am.